WebGL-Publisher uses the WebGL-Standard which is supported by various browsers on different platforms and operating systems. The exported models can be viewed in any WebGL enabled browser without additional software installation. 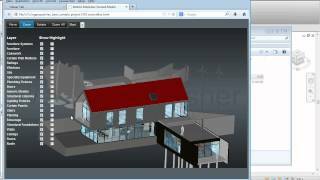 After installation WebGL-Publisher Export for Autodesk® Revit® 10 exports can be performed without a license. The target directory must be defined in the export dialog where the export should be written to. The WPG export must be started in an active 3D View. The export itself creates a wpm file (WebGL-Publisher Model) and an HTML file which displays the exported model. The generated HTML file can then be opened directly in a WebGL enabled browser. To publish the model on the Web, the content of the target directory must just be copied to a website. After the installation of WebGL-Publisher Export for Autodesk® Revit® it can be tested in a 30 day trial period without restrictions. During this trial period, the text "trial" and the number of left test days are displayed in the export dialog.